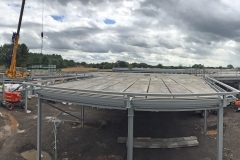 The SKA Global Headquarters will be the home of the SKA Observatory, the intergovernmental organisation set up to build and operate the Square Kilometre Array. 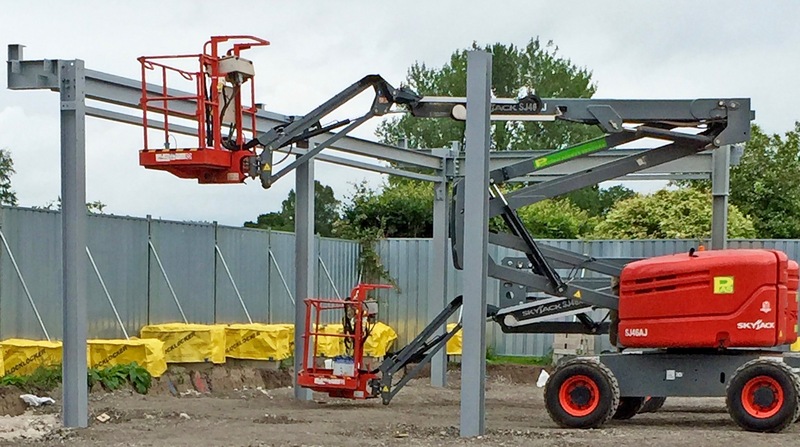 The headquarters design team have been following the RIBA Plan of Work, which is the definitive UK model for the building design and construction process. 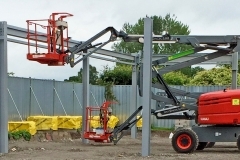 Below is an up-to-date version of the SKA’s RIBA timeline, which indicates a number of key project stages throughout the design and construction process. The SKA Global Headquarters will be the home of the SKA Observatory, the intergovernmental organisation set up to build and operate the Square Kilometre Array, the world’s largest radio telescope. Home to some 135 staff from around the world, it will be tasked with managing the construction and remotely monitoring the operation of the telescope, itself located in southern Africa and Western Australia. 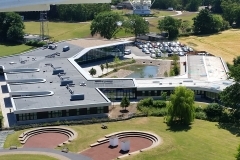 The process for selecting the permanent headquarters began in 2014 when, following an agreed plan, members of SKA Organisation were invited to submit bids. Two bids were received, from Italy and the United Kingdom, both of which were judged to be excellent and both suitable for the project’s needs. 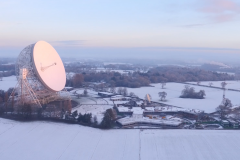 After thorough consideration, the Members of the SKA Organisation expressed their preference for the United Kingdom’s Jodrell Bank site as the future home for the SKA headquarters, thanks to the strong package offered by the UK government. 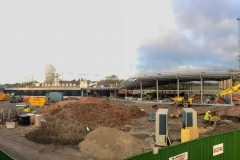 The UK plan was backed by the UK government via the Science and Technology Facilities Council, the University of Manchester and Cheshire East Council, as well as Oxford and Cambridge Universities, to design and construct a unique campus for one of the most inspirational science projects of the 21st Century. 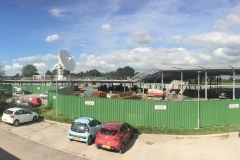 The SKA Observatory’s Global Headquarters will share a common site with the University of Manchester’s existing Jodrell Bank Observatory and Discovery Centre. 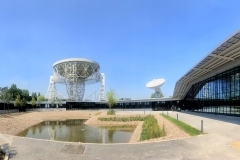 Jodrell Bank Observatory – part of the Jodrell Bank Centre for Astrophysics under University of Manchester’s School of Physics & Astronomy – is a working scientific facility. 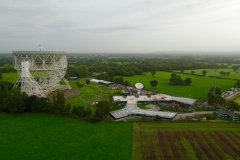 It operates the Grade-I listed 76-metre Lovell Telescope (jointly funded by the University of Manchester & STFC) – the third largest steerable radio telescope in the world – and a distributed network of 6 additional radio telescopes that form the UK’s e-MERLIN Radio Astronomy National Facility. e-MERLIN also regularly operates as part of the renowned European VLBI Network (EVN). The historical observatory was initially established in 1945 by Sir Bernard Lovell to investigate cosmic rays after his work on radar during the Second World War. It has since played an important role in a number of fields, including the study of meteors, quasars, pulsars, masers and gravitational lenses, and was heavily involved with the tracking of space probes at the start of the Space Age. 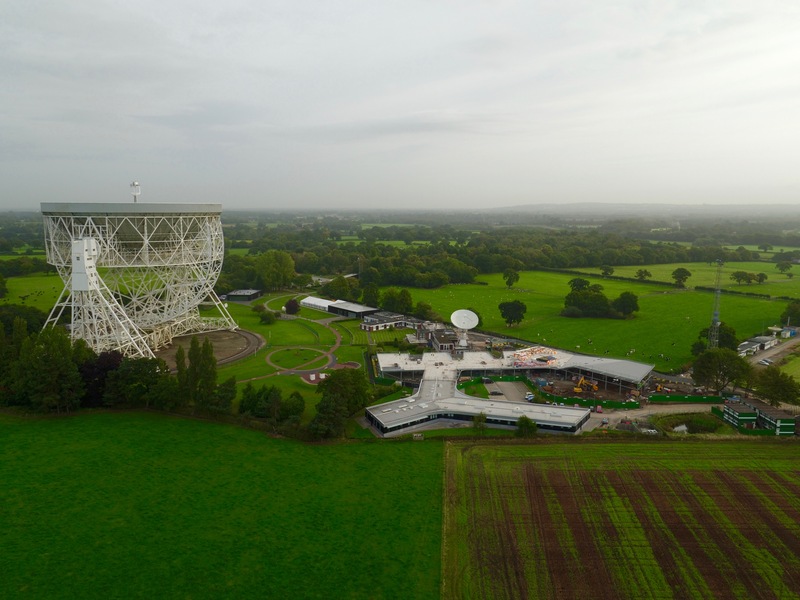 As such, Jodrell Bank has been a leader in radio astronomy for over 70 years and is now on the UK shortlist for UNESCO World Heritage Site status. 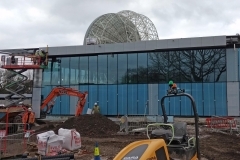 The Jodrell Bank Discovery Centre is responsible for public access to and engagement with both the science and heritage of Jodrell Bank. 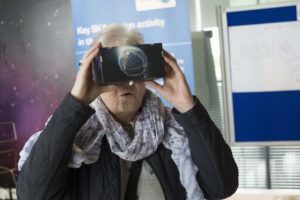 It is a renowned national and global leader in engaging the public with science and has a central focus on ‘inspiring the scientists of the future’ – which represents the start of the pipeline for skills in STEM. 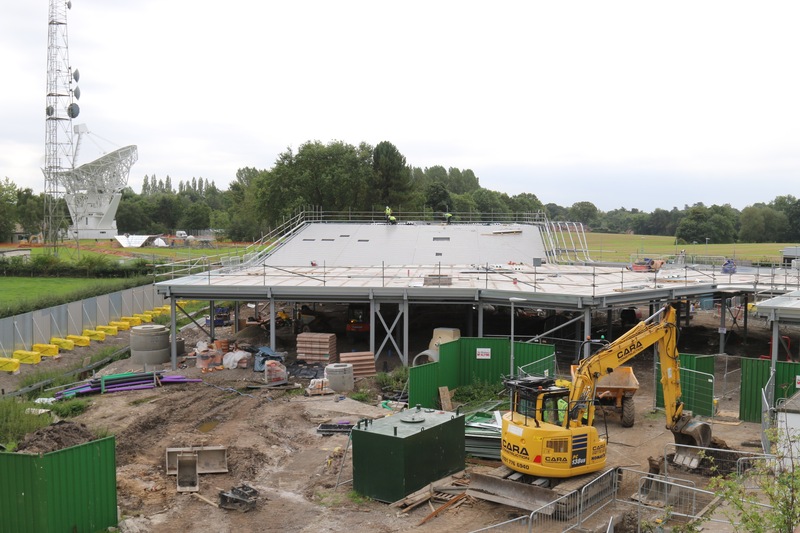 The Centre currently attracts around 165,000 visitors each year, including 22,000 school pupils on educational visits, and has ambitious plans for expansion supported by the Heritage Lottery Fund. 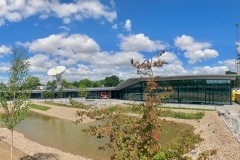 The new SKA Global Headquarters will be reflective of one of the most innovative science research organisations in the world. 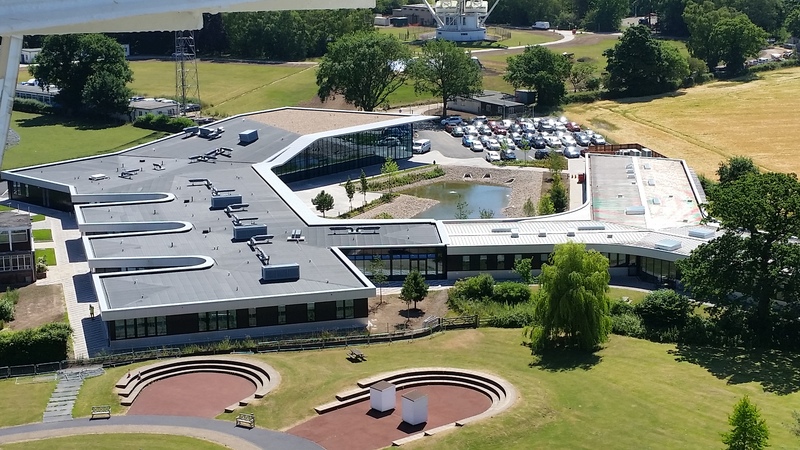 An inspirational building that reflects the science and vision behind the SKA project and that fosters a culture of collaboration and communication. 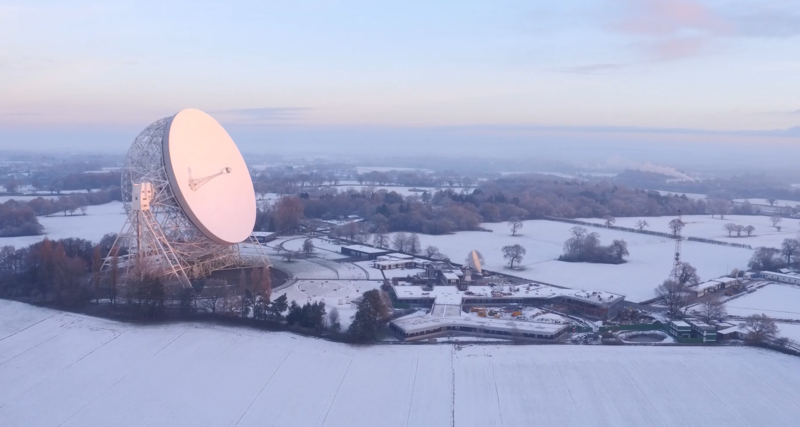 The unique character and history of Jodrell Bank presents an opportunity to create an inspirational workplace and the global headquarters for the SKA organisation at the home of radio astronomy. 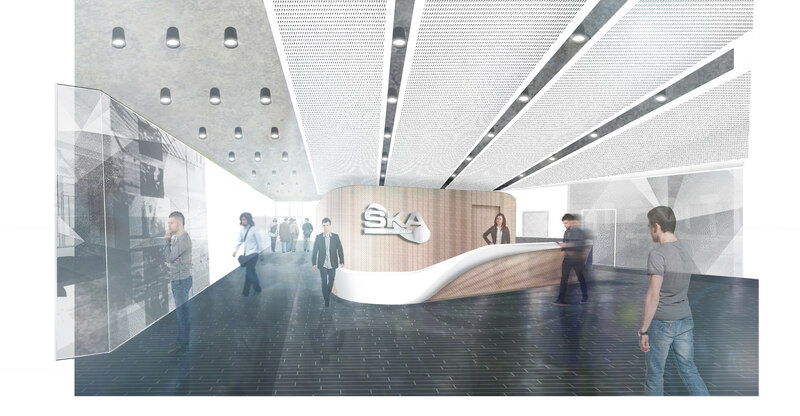 Whilst acknowledging and celebrating the physical and historical context of the place, the building aims to create its own distinctive identity and unique architecture that represents the SKA organisation and the science behind the SKA project. 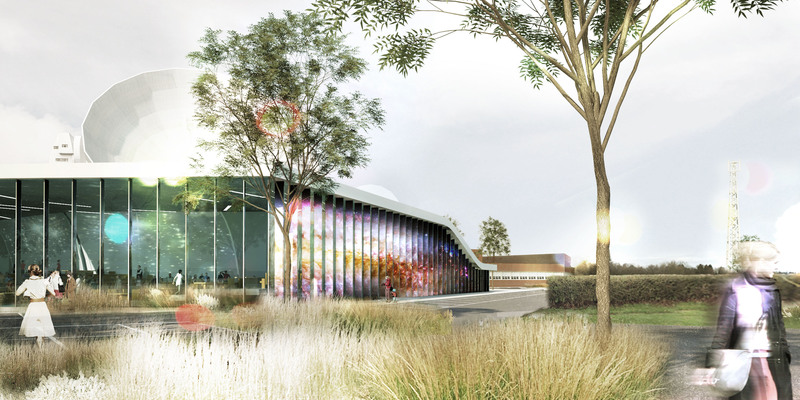 The proposed design takes inspiration from the radio waves that are at the heart of the SKA’s work while embracing its natural environment, playing on the contrast between the cutting edge science taking place within the building and the rural life taking place around it. The 4,200m2 SKA GHQ will eventually be home to more than 135 staff from more than 13 countries, tasked with managing the construction and remotely monitoring the operations of the Square Kilometre Array telescopes, located in Southern Africa and Western Australia. 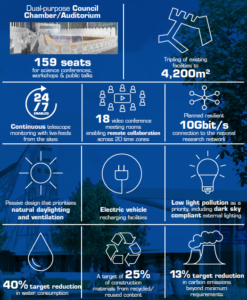 Equipped with a 10Gbit/s connection to the national research network, the building will include some 18 meeting rooms equipped with state-of-the-art videoconferencing to work with teams spread over 20 time zones, as well as a Council Chamber which can be converted into a 160-seat auditorium for scientific conferences and public talks. With a 40% target reduction in water consumption, 25% of construction materials from recycled or reused content, electric vehicle charging points as well as dark-sky compliant lighting and a highly efficient heat pump system, the building is also aiming to achieve a BREEAM target of ‘Very Good’. 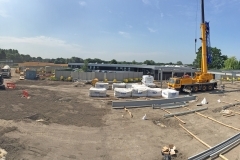 The £16.5 million new SKA Global Headquarters is funded by the UK Government’s Department for Business, Energy & Industrial Strategy (£9.8M) and the University of Manchester (£5.7M) with contributions from Cheshire East Council (£1M). Curious about the project? Would you like to see more plans and artist impressions? Then visit vr.skatelescope.org from your desktop to find out more. If you have your own VR headset, the content is also accessible in 360 degrees.